It is pretty easy to use start parameter e.g. program arguments in Don't Sleep for example to use for launch via batch file! 1.) ... The program parameters! 2.) ... Start Don't Sleep always minimized! See also: ► Disable Please Sleep in Don't Sleep! Here are the program-arguments in Don't Sleep. set_timer=10 Set the Timer in minutes, in the example 10 minutes. See: ► ... please sleep in Do not Sleep! upcoming_slep_message_sec=120 Display notification / message 120 seconds before expiration. Please read this: ► TV sleep function with Please Sleep in Don't Sleep! (Image-1) Start parameter in DontSleep e.g. for a batch file! 2.) Start Don't Sleep always minimized! 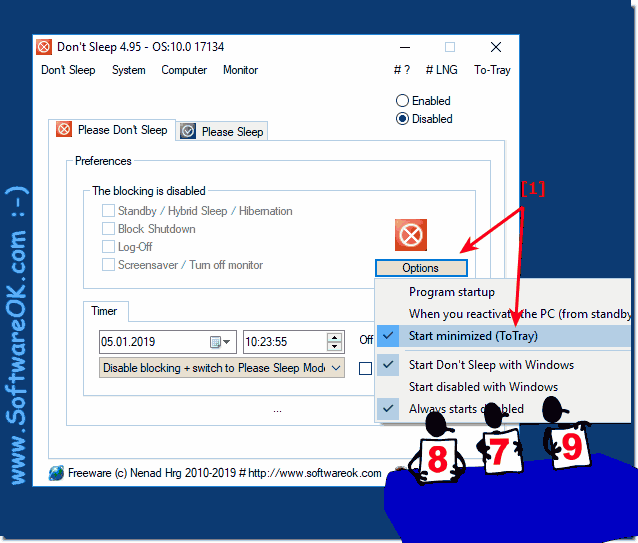 (Image-2) Start Don't Sleep, minimized in info area example! As you can see above in Windows 10 shot screenshot, it is easy to permanently start the energy options monitor always in the info area of ​​the taskbar. However, you can continue to apply and use Guard Power Options on earlier versions of Microsoft's Windows operating systems, whether it's a plain Windows desktop, tablet-based, Surface Pro / Go, or even a server operating system. 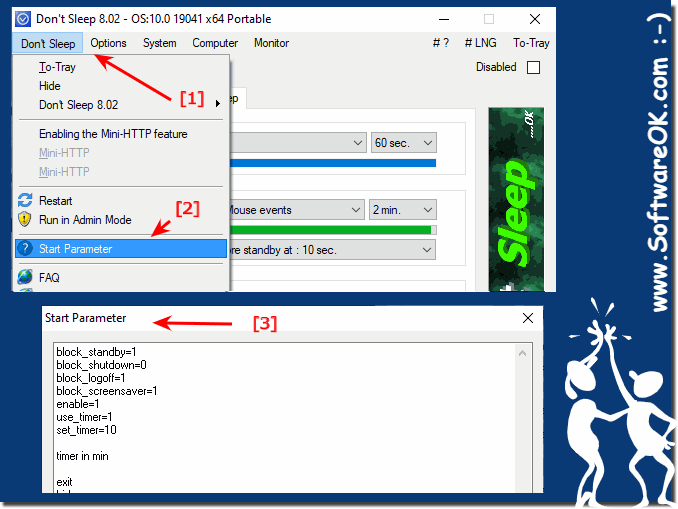 DontSleep - FAQ-6: Start parameter in Don't Sleep, for example for a batch file?